Collegiate Members - Anti-Hazing Initiative - Sigma Nu Fraternity, Inc. Since Sigma Nu's inception back in 1869, we have and will continue to take a strong stance against hazing. Our Anti-Hazing initiatives are designed to bring awareness and resources to chapters to help combat the dangerous practice of hazing. "... any action taken or situation created, intentionally, whether on or off fraternity premises, to produce mental or physical discomfort, embarrassment, harassment or ridicule. Such activities may include but are not limited to the following: paddling in any form; creation of excessive fatigue; physical and psychological shocks; quests, treasure hunts, scavenger hunts, road trips, lineups or any other such activities carried on outside or inside the confines of the chapter house; wearing, publicly, apparel which is conspicuous and not normally in good taste; engaging in public stunts and buffoonery; morally degrading or humiliating games and activities; late work sessions which interfere with scholastic activities; and any other activities which are not consistent with fraternal law, ritual or policy or the regulations and policies of the educational institution. The willingness of any individual to participate in any hazing activity does not excuse any hazing violation." If you believe that you have been hazed, or if you know somebody who may have been hazed, please call our toll-free Anti-Hazing Hotline at 1-888-NOT-HAZE or send an e-mail to anti-hazing@sigmanu.org. You do not have to give your name. 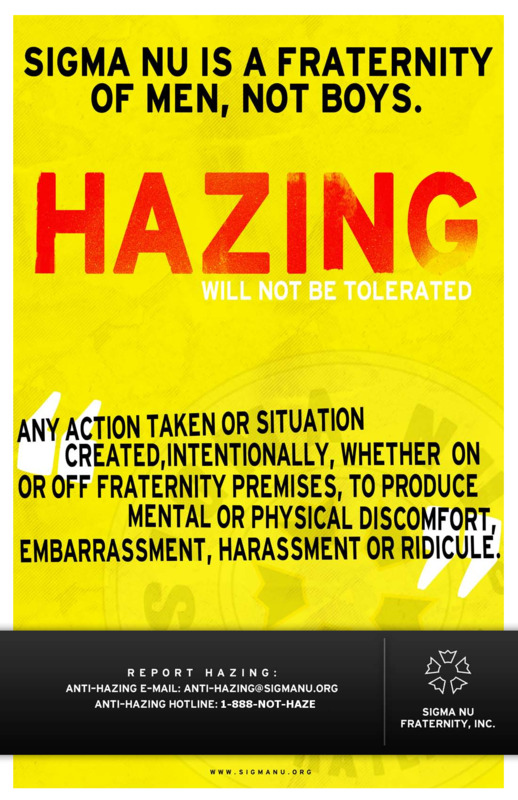 Download and print our Anti-Hazing Poster. Also, learn more about Sigma Nu's efforts to support the important mission of HazingPrevention.Org. Does your chapter want to lead the fight against hazing on your campus? How about increasing awareness about the perils of hazing? Are you looking for a way to participate in National Hazing Prevention Week? If so, this workshop is for you. "A Different Look at Hazing" workshop is designed to be appropriate for Sigma Nu members or an audience of any segment of the student body. It is recommended that the chapter invite members of all campus student organizations including, but not limited to athletic teams, student government association, professional associations, and other Fraternities and Sororities. Ideally, the workshop should be facilitated as part of the chapter's National Hazing Prevention Week participation but the message is relevant at any point during the year.